Interactive content is grabbing attention of businesses in a big way. In fact, interactive content has hugely impacted small businesses make strategies to draw in more customers. Almost every small business is creating and marketing interactive content in a bid to increase their reach amongst target customers and audiences. But creating interactive content that enriches, entertains and engages users in equal measures is easier said than done. 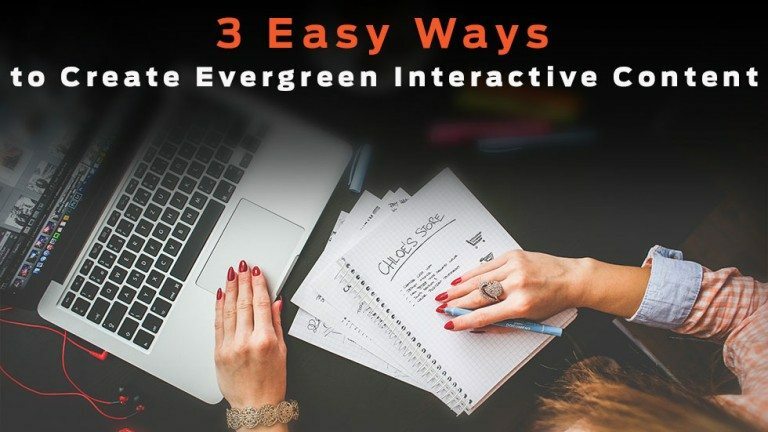 Here, we present to you 3 ways to create evergreen interactive content that is sure to encourage people to take part in the issues discussed and share it with others. But before we delve in the nitty-gritty interactive content creation, do well to make sure that everything from your responsive website design to your social media pages—speaks to your target market and resonates with them in the best way. 1. Turn Your Static Videos Into Interactive – Static content isn’t effective any longer in garnering the interest and attention of your visitors. So it makes sense to repurpose your successful static content into an engaging and interesting interactive format. Remember, static video advertisements are just like one way dialogue and people watching the videos are mere spectators. Whereas interactive videos allow visitors to contribute their bit in advancing the cause of the content. So, when creating videos, do well to ensure interactive format, so that your visitors participate and contribute to your business. For example, you can add interactive hotspots that are the tags to track motion. You may also allow viewers to click on links on the video so that they can learn more about your products or services. Another way to make your video content interactive is to tell a story that presents your business in an appealing way. While telling the story, give viewers options to click on some links that take them to your website. A survey reveals that 86% businesses plan to repurpose their content within the next 12 months. 2. Generate Excitement with Your Content – Your interactive content must make the viewers or readers excited about what you are presenting to them. It is human nature to be excited and intrigued with facts and data that’s interactive. So, do well to incorporate games, problem solving tests and motion interactions to make content interactive, engaging and unique for your visitors. You can also include providing flash games, scratch away and spin games, puzzles, etc. as a part of your promotions and discounts to summon interest and attention of your users. Similarly, allow the viewers to shake, move, blink and tilt figures while you attract them with your offers of discounts. 3. Use Polling As A Tool – Polling is in fact a great interactive tool. While on the face of it, polling merely seems to collect people’s opinion on an issue, clever marketers and businesses know how it can be explored to bring traffic to their sites. Through polling, you can collect feedback from your audiences. For maximum interaction, ask easy questions to your audience so that they do not get bored while voting. They love to express their point of view if the poll topic is interesting and engaging. But do not stop at just asking them to vote. When the results are out, ask them to comment on it. This way, you will ensure double participation from your audience. There’s absolutely no dearth of interactive content tools on the internet that make it easy for you to create Poll based contest. Some classic examples are Polldaddy and Wedgies. These tools enable you to launch your polls effectively with a clear purpose. Do well to go interactive in 2015 with these three tips in mind and you will surely go a long way in creating more followers for your business on social sites and elsewhere. Next Next post: How To Create Engaging Interactive Infographic For Your Startup?